This recipe is brought to you by Hurst’s Hambeens Brand. Thanks so much for supporting my blog and its sponsors. 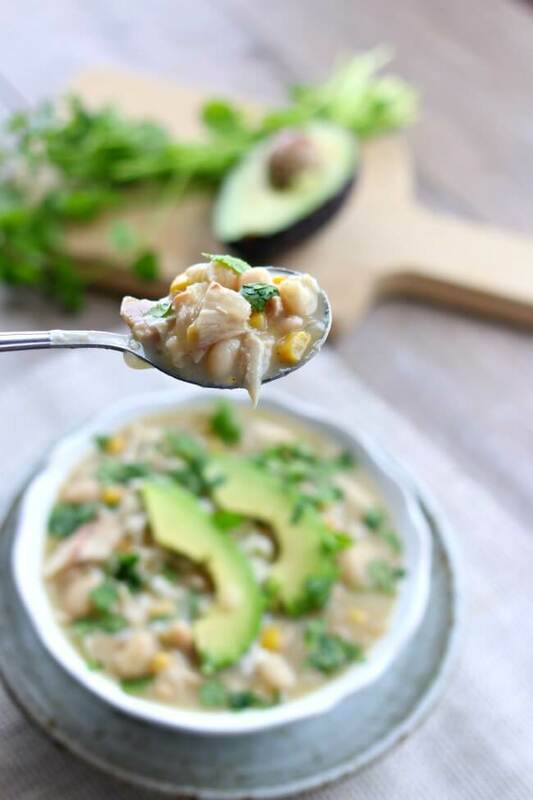 Slow Cooker Healthy White Turkey Chili–a gluten-free, creamy chili made with dried white beans, tender bites of leftover turkey, creamy broth made with protein-packed Greek yogurt, crumbly queso fresco, slices of avocado and a splash of lime juice for flavor. I have to admit that I really really love cream based soups. I love the creaminess and the flavor. However, they typically aren’t the most healthy soups since they usually have butter and flour and heavy cream in them. 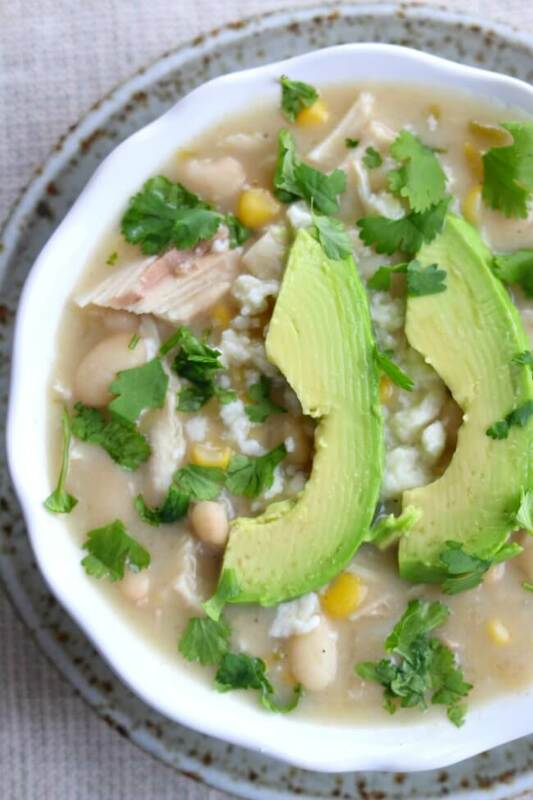 Well, this soup recipe for Slow Cooker Healthy White Turkey Chili gives you the flavor and creaminess that you desire without all the extra fat and calories. 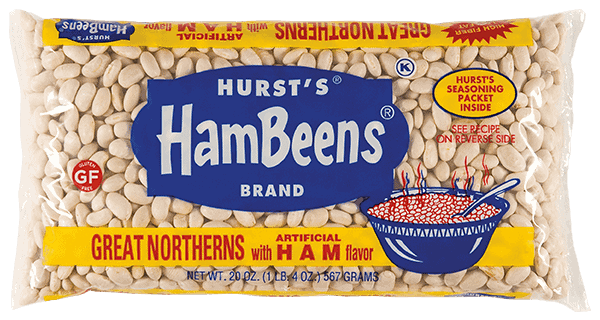 You’ll start with a package of Hurst’s Hambeens Great Northern Beans. These dried beans come with a magical seasoning packet that transform any soup from mediocre to awesome. So make sure not to throw the little packet away. I always like to soak my dried beans overnight in a salty bowl of water. The salt tenderizes the beans and the texture just comes out a lot better. The next morning you’ll drain and rinse the beans and add them your large slow cooker along with some diced up onions, for flavor, and water. Let the beans cook all day until they are tender and then you’ll add in some good stuff like green chiles for flavor and Greek yogurt for creaminess. In order to produce a thicker and creamier soup without adding calories I also removed 2 cups of the beans and pureed them in a blender. And then added the puree back into the crockpot. For this recipe I used cubed leftover turkey since I just cooked a large 15 pound turkey and we had tons of leftovers. If you prefer chicken, you can always add in cooked and cubed chicken or rotisserie chicken from the grocery store. Then you’ll top your soup with some nice slices of avocado, cilantro and queso fresco. YUM! 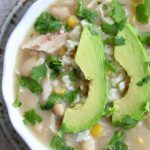 For this recipe for Slow Cooker Healthy White Turkey Chili I used my 6 quart oval Kitchenaid slow cooker. I love this slow cooker (you can see me talking about it in a video here). It cooks low and evenly. I love the medium heat choice because most slow cookers that I’ve seen only have the option of cooking on low or high. If you’re going to buy just one slow cooker, this is the one that I recommend. 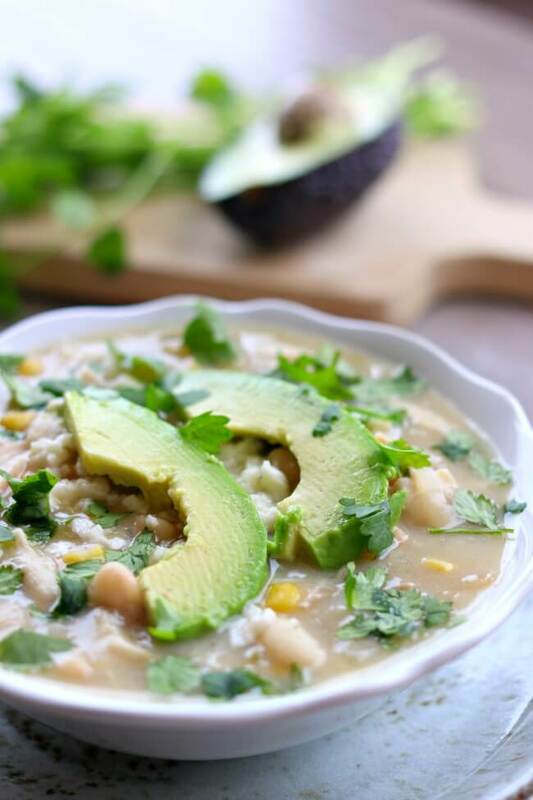 A gluten-free, creamy chili made with dried white beans, tender bites of leftover turkey, creamy broth made with protein-packed Greek yogurt, crumbly queso fresco, slices of avocado and a splash of lime juice for flavor. In a large bowl place the beans (reserve the seasoning packet for later) and cover them completely with water. Add in 1 Tbsp of salt. Let the beans soak overnight for at least 8 hours. Drain the beans and rinse them off. Add the beans to the slow cooker. Add in 8 cups of water and the diced onion. Cook on HIGH for 4 hours or on low for 8-10 hours, or until beans are tender. Ladle out 2 cups of the beans and place in a blender. Puree the beans (venting for heat) and then add the pureed beans back into the slow cooker. Add in the seasoning packet, green chiles, corn, yogurt*, turkey, salt, pepper, cumin and lime juice. Stir until creamy. Ladle in serving bowls and top each bowl with a bit of queso fresco, some sliced avocado and cilantro leaves. Enjoy! *If the Greek yogurt is non-fat you may want to consider adding in one cup of warmed half and half. It gives it just a bit more flavor. If the Greek yogurt is full-fat, you’ll get enough flavor from that that you won’t need the half and half. This recipe is GLUTEN-FREE! If serving with queso fresco be sure to check ingredients to be sure there is no wheat. For more fun recipe ideas please visit Hurst’s Facebook page!